Long sleeves are in for 2019 weddings and the Gabbi style is perfectly on trend. With stretch long sleeves to ensure a comfortable fit, the Gabbi V-neck Wedding Dresses feature a lace bodice, along with a lace-up back. The sweetheart neckline of the dress is tucked under the lace for added detail. We have teamed the above shot with the Ultimate bridal belt. A slightly gathered chiffon A-line skirt provides a welcome contrast to the lace bodice. Gabby has a decidedly Bohemian vibe making it the perfect option for a rustic or beach ceremony. Maybe complement with a succulent bouquet for a degree of difference. It also pairs well with vintage style accessories. You’ll also love that the design allows you to order the gown with or without the train. 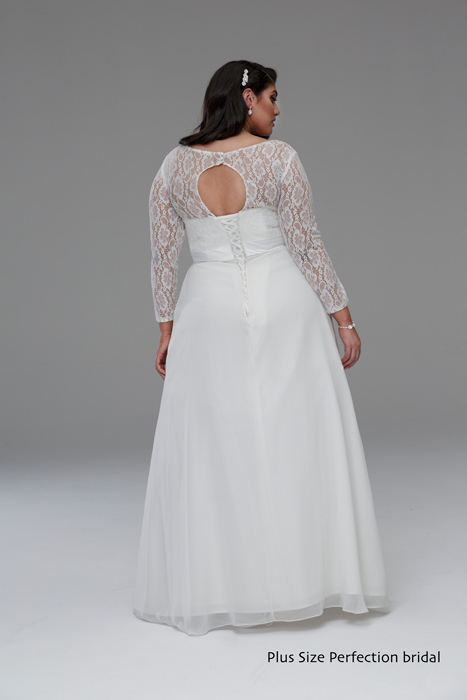 The Gabbi has even become quite popular as an affordable long sleeve wedding dress option in our collection. 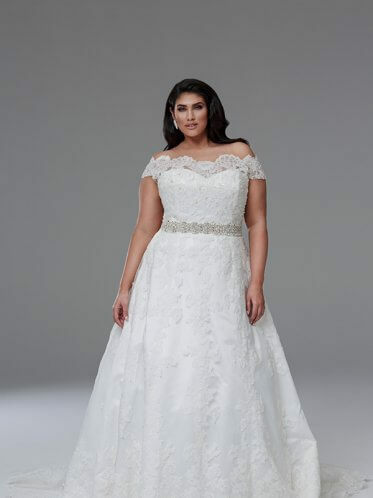 Despite the affordable price, there are many fine details, including a quality satin lining, demonstrate that this dress is just as refined as our other Plus Size Perfection Wedding Dresses. Long sleeve Key hole back feature. 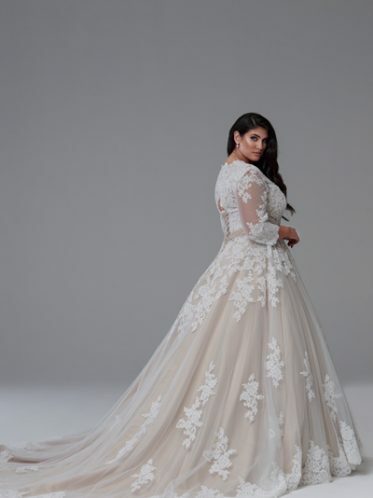 Plus Size Perfection Bridal label is our featured collection of plus size wedding dresses to help you look your best on your wedding day. A bridal gown is one of the most important choices you will ever make for your wedding reflecting your personality and sense of style. At Leah S Designs, we offer beautiful gowns to entice every bride on her special day. Two colour choices ivory and champagne/ ivory. Available in sizes 16 to 36 this gown is a classic A-line cut and a flattering style for most figure shapes. To view other bridal dresses with sleeves at Leah S Designs. Contact us for online sales. Complete the Gabbi, add a necklace, bracelet, bridal hair comb, and earrings. Featured here are the ballroom set and LS002 veil with crystal droplets which are minimal on their own, yet combine to create a romantic look that is simply stunning. Come visit our Melbourne bridal shop and see for yourself all the fantastic designer wedding gowns, on sale deb dresses and white and Ivory shoes Melbourne. Truly a paradise for everything bride.